“An ocean alien in the abyss stares back.” Wait, what? I just watched “The Abyss” for the first time and well… I’ve got some mixed feelings about it. On the one hand: Ed Harris and underwater survival. On the other hand: Aliens. Does anyone else think that James Cameron should have picked just one theme for this film?! It seriously made my brain hurt. Like, SCIENCE OVERLOAD. The biggest mystery, however, is how I ended up watching two James Cameron films back to back. I should have at least watched something a little more fluffy before diving in (pun intended) to another JC film. Just sayin’. -Ed Harris (“Bud”) looking deeply into the blue toilet water and asking, “What is the meaning of life?”. -JK, he just wanted his wedding ring back. -Pretty much every moment in the entire film where they get to wear these crazy-awesome diving suits. Just look at ‘em. FREAKING SCIENCE. -That one guy from “The Terminator” turns out to be a head case. Um, yeah. Get it together, Reese. You’ve got to save the future from robots, remember? -More weird alien stuff happens. At this point, my brain can’t take much more. It’s a sci-fi overload up in here. -The moment when Bud let’s Lindsay die, but then later he revives her by slapping her and yelling obscenities at her. -When Bud puts on a special dive suit with a breathable liquid. Brain explosion imminent. -ALIEN! 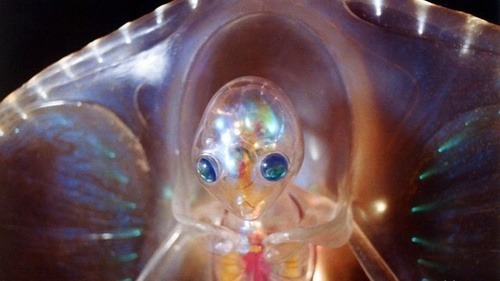 IT’S A FREAKING ALIEN. BRAIN EXPLOSION! Needless to say, this movie was a bit too much for me. I really loved the underwater, gritty oil rig crew turned heroes plot line. The aliens part of the story just ruined it for me. I also did a little bit of research on the making of this film. CRAZY! If you are interested, you can watch the behind the scenes footage here. Prepare to be impressed and appalled. Please excuse me while I go try to piece my cranium back together.